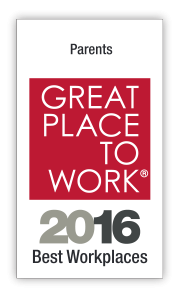 Today, we are honored to be named one of Fortune’s 2016 Best Workplaces for Parents. The award is based on a combination of anonymous employee feedback and a review of the benefits offered by companies to help mothers and fathers participate fully in their organizations. At Zillow Group, we take great pride in our company culture and perks that reflect what’s most important to our employees and their families. We are committed to providing a benefits program that is both competitive and comprehensive, with a strong focus on encouraging work-life balance. Our award-winning family benefits program is designed to help mothers, fathers and prospective parents maintain work-life balance and spend plenty of time with their loved ones. Interested in joining us? Check out our jobs page for current openings, or watch this video to see what it’s really like to work at Zillow Group.